Backed by seasoned professionals, gifted creative heads and a youthful team, Espanio has fallen in love with innovation Events with a signature of its own. 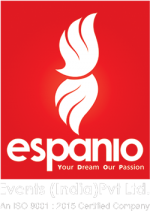 Espanio has made its entry in to the event horizon of Kerala in a grand way with many large scale Exhibition, impressive Fashion & Beauty Pageants, Wedding Events, Splendid stage show, Outstanding Launching Ceremonies, Prestigious TV Shows & Pompous Award Nights. We have stamped our own footprints in the industry that is still unparalleled and unmatched. Espanio is also supported by its sister concern Black & White Creation Pvt Ltd who has been into creative advertising. Black & White Creations, backed by a group of passionate professionals with a sparkling stream of ideas for brand promotion, is proud to be the pioneers of Train Branding in Kerala. We chose Railway Advertising as our core pursuit and we are proud to say that we are the No.1 Railway Advertising Agency in Kerala with extensive experience of more than 12 years in advertising throughout Southern Railway, South Central Railway, South Western Railway and East Coast Railway. We are the first to do a railway advertising for a political party in India-The Left Democratic Front( LDF) that won the May 2016 Kerala legislative assembly election, and is now in power. 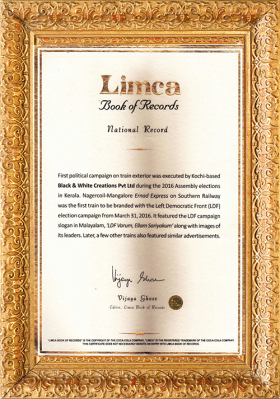 That was a proud moment for us as we were recognized by the LIMCA BOOK OF WORLD RECORDS 2016. Black and White Productions – a sister concern of Espanio Events India Pvt. Ltd. and Black and White Creations Pvt. Ltd. is constituted solely for movie productions. Black & White Productions is a dream child of its founders namely Mr. Anwar A.T. and Mr. Zulfi. The prime objective behind the constitution of this new venture is to produce worthy Movies and TV Commercials on a pan India basis. “Mattancherry”, is the debut movie from Black and White which is produced in the Malayalam language. This movie with eminent artists from Malayalam film industry expects the release by the end of 2017.